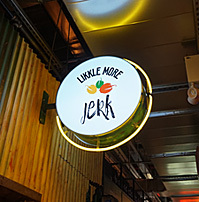 Caribbean cuisine shines at Likkle More Jerk at Dekalb Market Hall. We were drawn in by the flaky beef patties with just the right amount of spice. Chicken and vegetable patties are also available. For the full monty, get one wrapped in coconut bread. 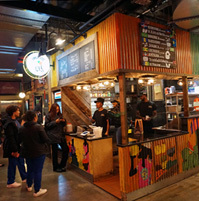 Jerk chicken, pork or fish are also offered with choice of waffle or rice & peas. Other dishes include oxtail stew and curry goat. Island drinks like ginger beer, sorrel and coconut water are also available. You might just leave a likkle bit happier.